’Tis the season to stay inside, cuddle up, and enjoy a big bowl of chili! I love the coziness of the fall and winter months, and I love the warm, hearty foods that they include. 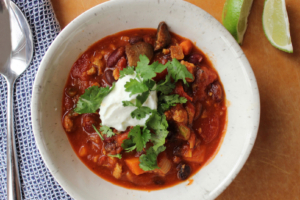 While there are a million chili recipes on the internet, I still want to throw this one into the ring because I just think it’s really good and versatile. Now, be forewarned that I make a very tomato-heavy chili so if tomatoes aren’t your thing, this recipe will not be for you (sorry). However, it is husband-approved in my house, insanely easy and adaptable, and will last you days. This version uses ground turkey, but you can use any type of meat, or red lentils instead (which I often do). It is also fairly mild as-is, so feel free to crank up the spice to your taste. Actually, after the first or second time making this I decided to forgo measuring out the spices and I now just start sprinkling things in and taste as I go. If you are lazy like me, go for that method. The other thing I love most about this recipe is that you can put almost anything in it, and it will taste good. You’ll see the vegetables that I included below, but sometimes I leave out the mushrooms, other times I add in kale or spinach, and I’ve been known to use butternut squash. Have some fun and find the combination that you like best. Honestly, this makes enough to fill up my huge pot, so I usually recommend freezing half and saving it for another night when you are low on time but in the chili mood. Enjoy! A hearty, warming meal for these cold winter months. Brown the turkey in your pot, then remove and set aside. In the same pan, saute the onion and garlic in the 2 Tbsp of olive oil over medium-high heat for 3-5 minutes, until onion starts to turn translucent. Add in the sweet potato, carrot, and bell pepper until vegetables start to soften, about 10 minutes. Add in the mushrooms and all of the spices, saute for about 2-3 more minutes. Add back in the browned ground turkey, along with the diced tomatoes and tomato sauce. Let all ingredients simmer over medium-low heat until all of the vegetables are fork tender and flavors have melded together. Adjust seasonings for your desired spice level. Serve with toppings of choice. Examples: sliced avocado, a dollop of plain yogurt, cilantro and a squeeze of fresh lime juice.